Istanbul draws millions of domestic and foreign tourists each year with its rich cultural heritage. One of the spots where that cultural heritage is at its most profound is the Historical Peninsula. The buildings on the Historical Peninsula are of great importance for different religions and different nations. 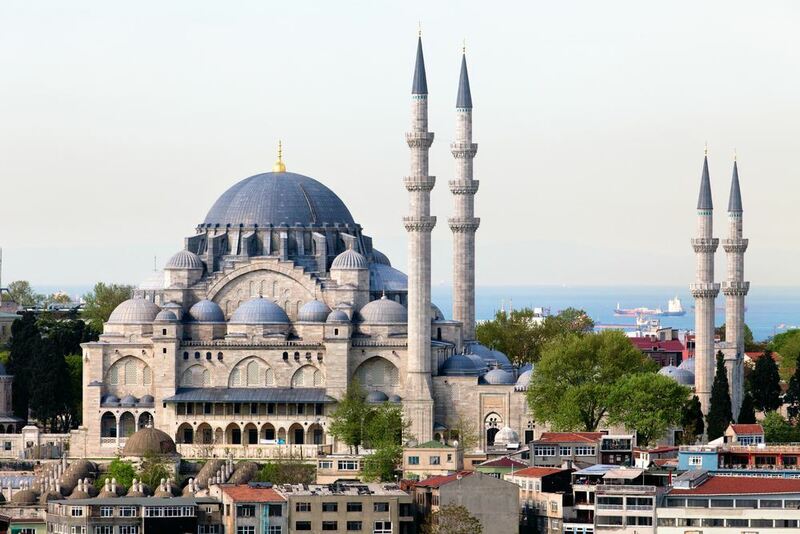 One of these is the Süleymaniye Mosque, which means a lot for the Turkish culture. A work of Sinan the Architect, the building is a perfect fusion of simplicity and grandiose. Let’s now get a more up-close look at the Süleymaniye Mosque, particularly its architectural peculiarities. Happy reading! Located in the district of Fatih, the Süleymaniye Mosque has a great religious significance. Also, it is one of the most important structures from the Ottoman era. The mosque is close to the Spice Bazaar and the Grand Bazaar. 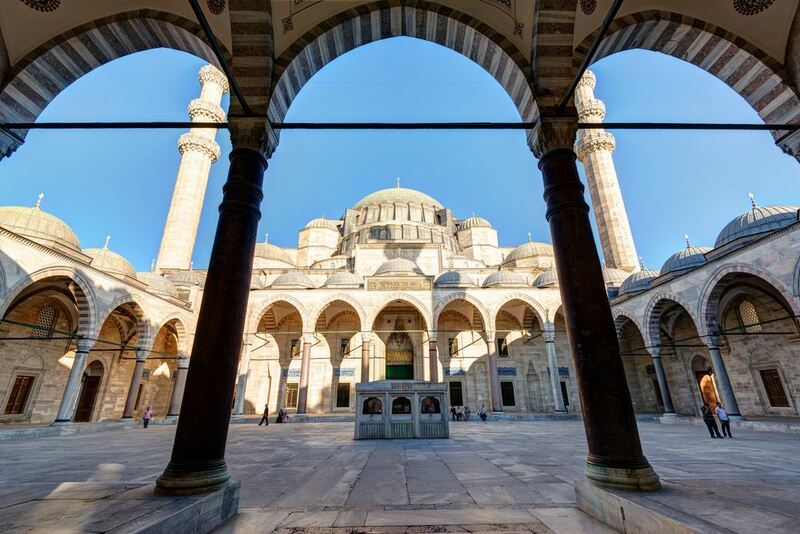 The construction of the Süleymaniye Mosque started in 1550 and ended in 1557. Dedicated to Prince Mehmed, the mosque was completed with the involvement of all state organs. It was commissioned by Suleiman the Magnificent. The public called it the “mosque that will remain forever” as a testament to its robust structure. It is the perfect illustration of Sinan’s ingenuity as an architect. The mosque was not just the representative of a higher moral ideal but also functioned as a den of learning. It is known to have been used as a social complex in its time. 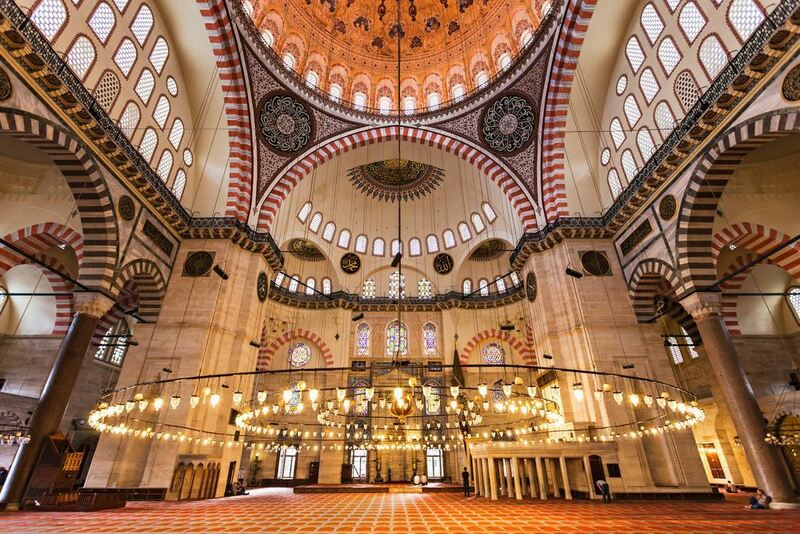 Though the mosque is acknowledged as the masterpiece of Sinan the Architect, the master himself called it “my work as a mere journeyman.” He thought everything through to the finest detail when designing the mosque. The four minarets of the Süleymaniye Mosque represent the four sultans who took the throne after the conquest of Constantinople. While the ten balconies on the minarets refer to Suleiman’s being the 10th Ottoman sultan. An atmosphere of unpretentious plainness strikes one when entering the mosque. But when you actually step in through the door, it bemuses you with its mesmerizing interior design features. There are four different columns inside all brought from different places all around the world. Among these are Istanbul’s Vefa district and Topkapı Palace, as well as the Baalbek Temple and the City of Alexandria. The dome has a height of 53 meters and a diameter of 27.5 meters. The mosque is perfectly designed in terms of natural lightening which is provided through 32 windows. Since it has great acoustics, sounds can be heard from every corner. It is known that it is those empty pots under the domes that partially explain why the acoustics are so good. There is even an interesting story told about the much vaunted acoustics. The construction of the Süleymaniye Mosque was almost over. Certain circles begrudging Sinan the Architect the adulation he received for his artistic ingenuity make a complaint to Sultan Suleiman that he was dragging his feet with the project. Hearing these complaints, Sultan Suleiman visits the mosque to see if the claims are true. And when he goes there, he sees Sinan smoking narghile, convincing him as to the veracity of the rumors. But, Sinan tells the Sultan that there is no tobacco inside the narghile and that he uses the bubbling sounds to test the travel of sound inside the mosque. The tombs in the courtyard of the Süleymaniye Mosque belong to dignitaries or renowned public figures in the Ottoman society such as Asiye and Rabia Sultan, Ahmed the Second, Suleiman the Magnificent, Hurrem Sultan and Sinan the Architect. A soot room was designed to prevent damage to the mosque from the candles and oil lamps. The soot was collected in this room to be later used as ink. The counterpart of the Hacer-ul Esved stone in the entrance of Suleiman’s Tomb is in the Kaaba. It is not allowed to touch the stone. The mosque also stands out in terms of the golden ratio. When the width is divided by the height, the golden ratio yields the value of 1.618. The same ratio you get with the Süleymaniye Mosque. All Ottoman mosques bore the symbol of universe. The crescent and the star on the minaret or the dome signify the universe culture of the Turks.